You don't have to take a vacation to taste the world, and with this beer gift basket, you don't have to make a personal appearance to tell someone that you're thinking about them. 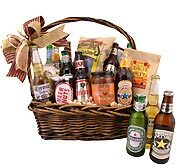 Allow us to pack a gift basket that's sure to impress the beer lover in your life, and you can claim the credit for thinking of an imaginative gift that is loaded with intense flavor. Whether you're miles away or stuck at work across town, this is the perfect way to say "I'm with you." 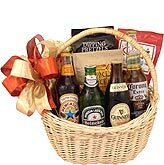 I've sent a beer basket at least four times now and everyone loves them! Shipping is really fast, product quality is good! What more can you ask for?? I'll keep sending them for sure. I sent a package to our good friend for the holidays. Called when it arrived to say how much they were enjoying it real time. Great job getting it there promptly. Will defineatly use this service again. It was a gift for a co-worker. I haven't heard if he received it yet. Can you let me know if/when it was delivered? We made the purchase for our Son's first Fathers Day Gift. He loved it. Great purchase, something different! Gave it to my 36 yr. old son-in-law. He loved it! Lovely package. I was pleased too! My friend was very pleased with the gift bssket.